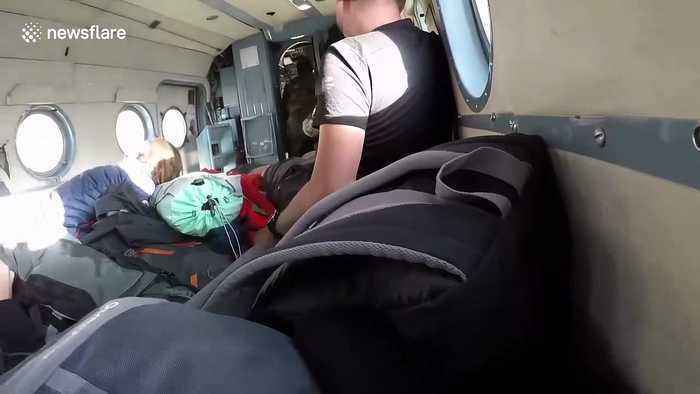 A dramatic video has emerged from Kyrgyzstan showing the moment a helicopter loaded with tourists crashed last year. The footage, which was filmed by one of those on board on July 9th 2018, shows the helicopter attempting to land at South Inylchek Glacier base camp in the Khan Tengri mountains when the pilot suddenly appears to lose control. The helicopter rises into the air again and appears to bank sharply before slamming into the ground and rolling over many times. Eventually, the helicopter comes to a stop and the filmer, who gave his name only as David, is able to escape the wreckage through a hole in the cabin. Incredibly, all those on board survived the crash, although many were injured, including four who were immediately flown to hospital with life-threatening injuries. One Polish woman was left paralysed from the waist down. According to the filmer, the tourists included two Germans, four Poles and four Japanese. "The panic set in when I felt the stinging of kerosene around my feet as my shoes were being drenched in it," David told Newsflare. "The fear of being burnt alive at any second made me struggle even harder," he added. According to the filmer, the cause of the crash hasn't been determined.